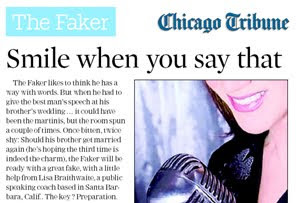 Last week I was interviewed for the Chicago Tribune's "Faker" column, where various experts give advice on how to fake your way through life situations. Columns have included faking a clean house, faking being a team player and faking being funny. My article, which came out in the April 11 Sunday paper, is on how to fake being a good speaker, and faking the confidence to look like a good speaker. 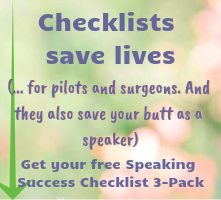 I had a lot of fun thinking up how a speaker can fake out the audience, but the truth is, if you're doing these things, you don't need to fake it. You're doing it for real! On a side note, I couldn't help but giggle about "faking it" myself, when other experts interviewed for The Faker have been nationally known authors, actors and celebrities, including Clinton Kelly from the TV show "What Not to Wear." And that's the great thing about thinking you're faking it, or hoping you're pulling something off. You usually are. And then you're not really faking it! 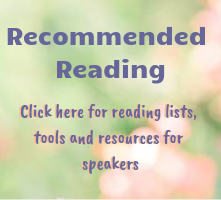 Check out the online version here. Here's a PDF of the page in the newspaper.